The Knicks started another game well, only to quit playing after halftime as they marked their 51st loss of the season, 97-73 to the Orlando Magic. However, things are not as dramatic as they seem since the loss came against a lottery rival, and yet the Magic hold a far worse record, New York are now ahead of Chicago in the draft table. 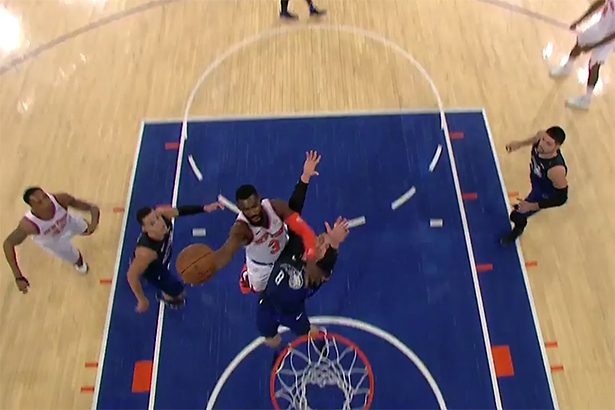 Tim Hardaway Jr. led the Knicks with 16 points and Kyle O’Quinn added 13 buckets and 12 boards. Most of the numbers were put in the first half while in the second, they barely tried, shooting 1-5, respectively 2-3. Trey Burke contributed with 15 points in another start and Courtney Lee, off the bench, dropped 13. The Magic, on the other hand, had Mario Hezonja scoring a game high 19 points while the undrafted Jamel Artis scored a season-high 16 points off the bench. With four more games on the calendar, all of them against playoff teams, Hardaway called his teammates and asked them to show pride in what’s left. With only 73 points scored, the Knicks matched their season low, originally set on January 31st against the Celtics.